The City of Boston Local Consumer Market Consists of Over 650,000 Residents and 360,000 Daily Visitors. Combined, the City of Boston Local Residential Population Alone Represent an Average "Daily" Disposable Income Spending Power of Over $5,400,000 Each Day. Your Boston Local Consumer Market Represents Over 80% of Your Business Income & Profits. Are You Receiving Your Share of This Boston Local Consumer Spending? Want to Increase Your Share? 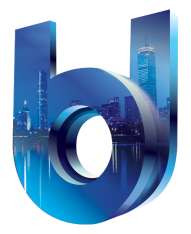 As a 100% Mobile Customer Engagement Tool, The Boston Directory Can Effectively Position Your Business to Capture Even More Of The Boston Local Consumer Market's Disposable Dollars Allocated to the Type of Products and/or Services You Provide. 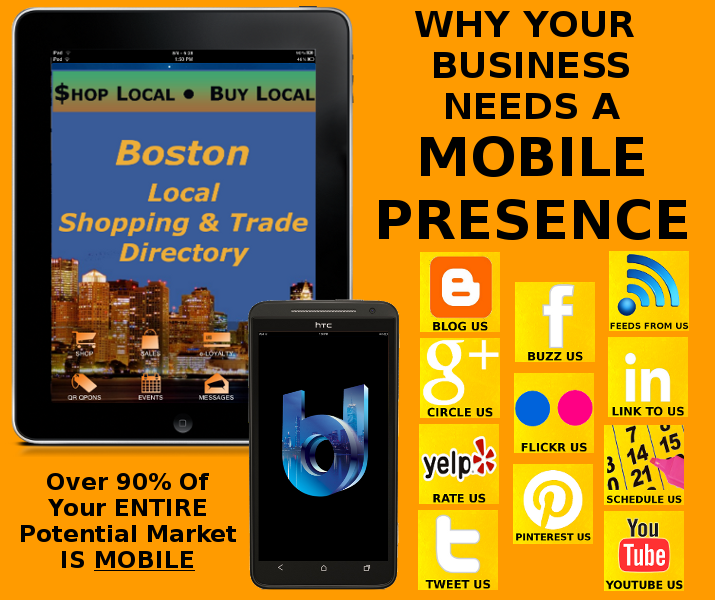 The Ability to Effectively Reach Over 90% of Your Entire Boston Local Consumer Market All Day.... Every Day. Directly Interact With Both Your Boston Local Market Community of Over 900,000 AND Their Social "Connections" Daily NO MATTER WHERE THEY ARE 24x7! The Purchasing Habits of Today's Consumer Lifestyle Has Recently Evolved... Dramatically! Over 90% of The Entire U.S. is Mobile. They're Connected and Social 24x7. 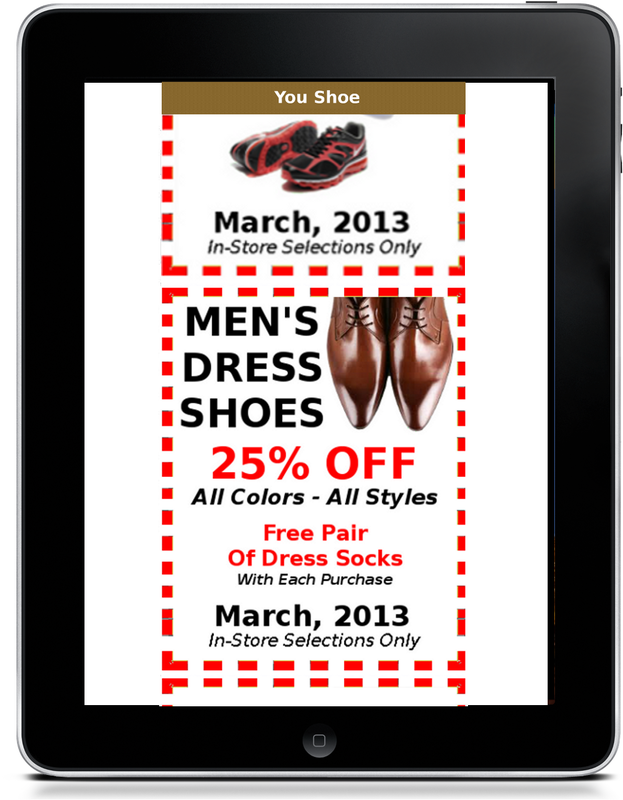 Your Customers Are Mobile 24x7! Are You? 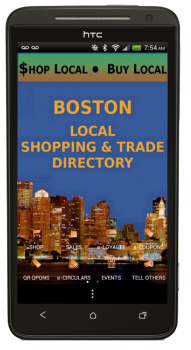 Use The Boston Directory to Connect With More of Your Boston Local Consumer Market in a 100% Mobile Local Search and Marketing Environment That Fully-Engages Your Business in Today's 24x7 Consumer Lifestyle. BE FOUND Whenever and Wherever They Want, Need or Desire to Refer You. YOUR ADs & Marketing Incentives Available 24x7 to Over 900,000 of Your Boston Local Consumer Market (Even More via the Included Direct Social Media Accessibility) With NO OUTSIDE COMPETITION! Big-Budget Competitors Spend Over $25K Each Week to Inundate Your Boston Local Market With Coupons, Circulars and Advertisements. Over 1.1 Million Mailings to Boston Area Mailboxes Alone... Every Week! Tens of Thousands of eCoupons Delivered to Boston Local Consumer E-Mail Boxes... Daily! Thousands Spent on Newspaper Ads to Reach Out to Your Boston Local Customers... Daily! Ready to REALLY Compete... Smartly? For Less? 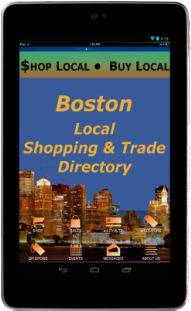 With The Boston Directory, a 100% Mobile Marketing Engine, You can NOW, Implement the SAME Tools (Coupons, Weekly Sales Circulars and Coupon Circulars and Loyalty Cards) They Use, Only You Use Them In a 100% Mobile Environment (<90% of Us Are Mobile 24x7) More Efficiently & Cost-Effectively; Making Your Ads and Marketing Incentives Available to Virtually Your Entire Boston Local Consumer Market Throughout Today's Consumers' Peak Shopping Hours... ALL 24 Of Them... EVERYDAY! First 'LOL', Then Contact Us to GET STARTED! Like We Said... Smarter... For Less! 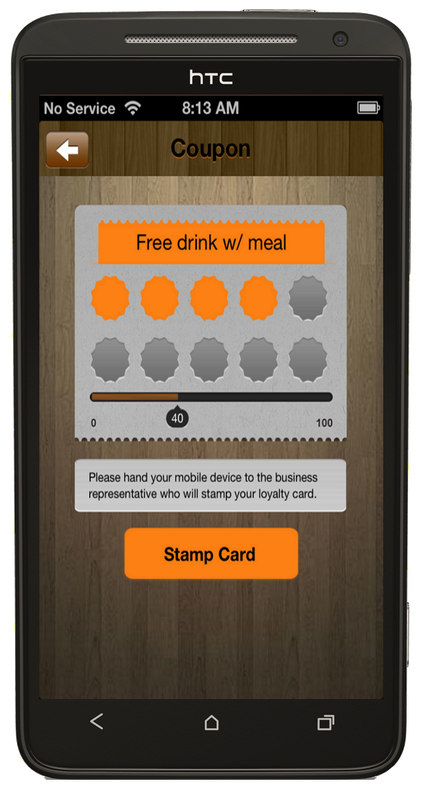 Coupons and Loyalty Cards, Branded to Your Business, Conveniently Stored, Maintained and Redeemed RIGHT ON THE DEVICE... 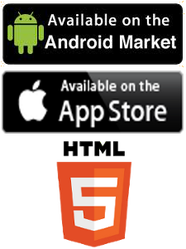 Virtually ANY Mobile Device! 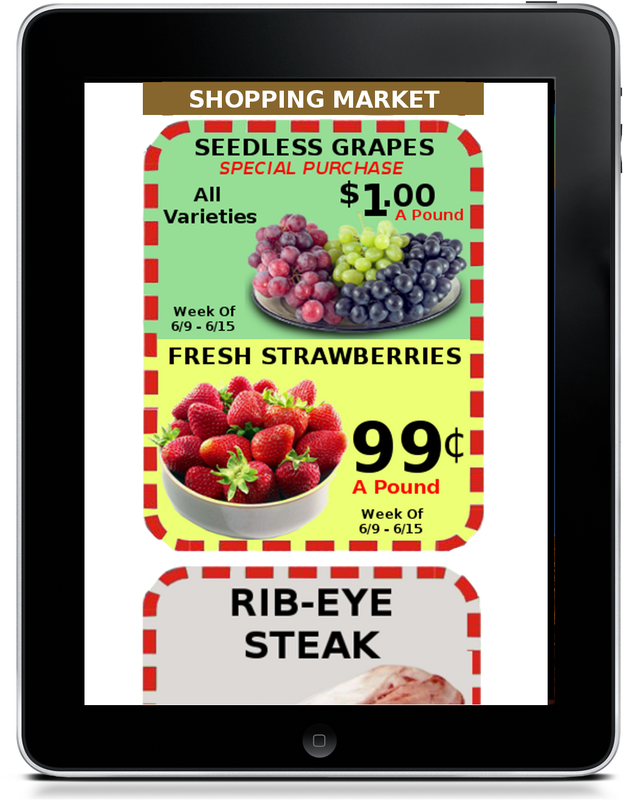 How About Fully-Branded Sales and Coupon Circulars, That are Also Easily Stored, Maintained and Redeemable RIGHT ON THE DEVICE! Exclusive to the Entire City of Boston Local Business Community, The Boston Directory is Boston's ONLY 100% Mobile Boston Local Search, Mobile Marketing & Customer Engagement Vehicle That Places All of Your Marketing Messages, Coupons, Loyalty Cards, Coupon Circulars, In-Store Weekly Sales Circulars and Other Local Marketing Incentives Instantly and Cost- Effectively At The Virtual Fingertips of Over 90% of Your Entire City of Boston Local, Nationwide, Global and Social Media-Driven Boston Local Consumer Market All Day... Every Day. 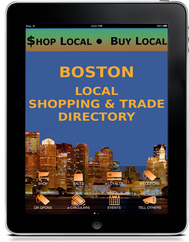 Boston Local (The Boston Directory Apps & Mobile Website) is Available 24x7 as an iPhone App, iPad App, iPod Touch App, Android Smartphone and Tablet App, and a Full HTML5-Compliant Mobile Website. This Flexibility Allows Boston Local Business Owners Exclusive 24x7 Consumer Reach and Accessibility to Over 95% of the Boston Local Consumer Market, Plus Over 98% of the Entire U.S. Mobile Market as well as the Over 5.2 Billion Worldwide Active Mobile Market. "WE DO ALL THE WORK"